LikeFinland team visited the North-Western Lapland and experienced the magical polar night time in Muonio, Finland. During the polar night time the sun does not rise above the horizon. In Muonio we visited one of the Northwest Lapland's most traditional accommodation sites, Guesthouse Lomamaja Pekonen, which is located in the middle of Muonio village. Family business has served travelers since 1963, providing high level cabins and apartments. 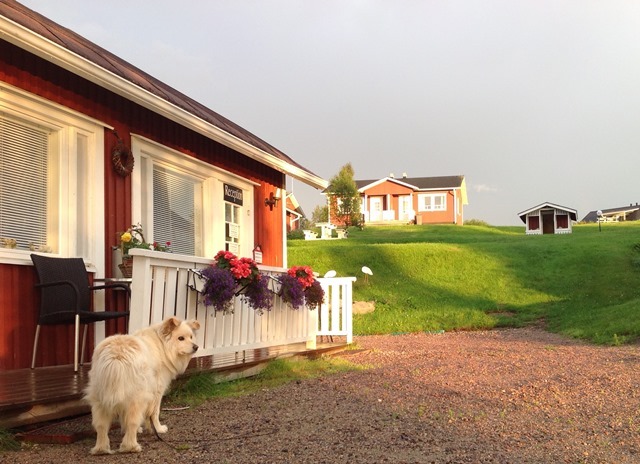 We received a warm welcome from Paula Pekonen, an entrepeneur of the guesthouse, and from 11-year-old Finnish Lapphund Vilpo. 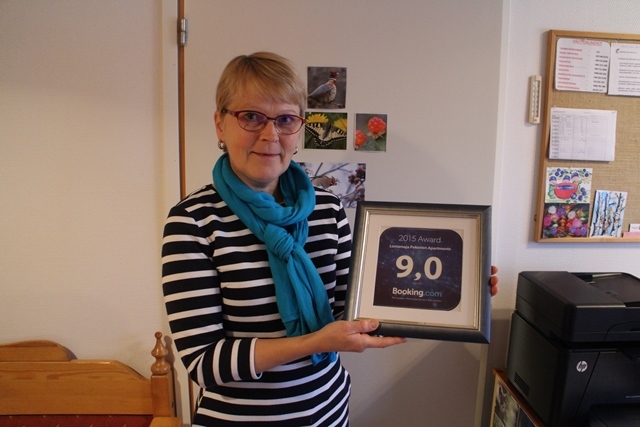 "Vilpo have made friends with visitors so well, that it gets cards and gifts." Paula says. Paula Pekonen, who also loves nature and knows hiking trails and kayaking routes as well as her own pockets, has been a full-time entrepreneur since 1983. Paula and her husband Pentti Pekonen continued the work that Pentti's parents, Hilja and Väinö Pekonen, had started in Muonio over 50 years ago. Lomamaja Pekonen is located in the center of Muonio. Muonio is perfectly along the way, if you are heading to Enontekiö or to Norway. The guesthouse have visitors all year round, such as skiers, hikers, berry pickers, fishermen and photographers. 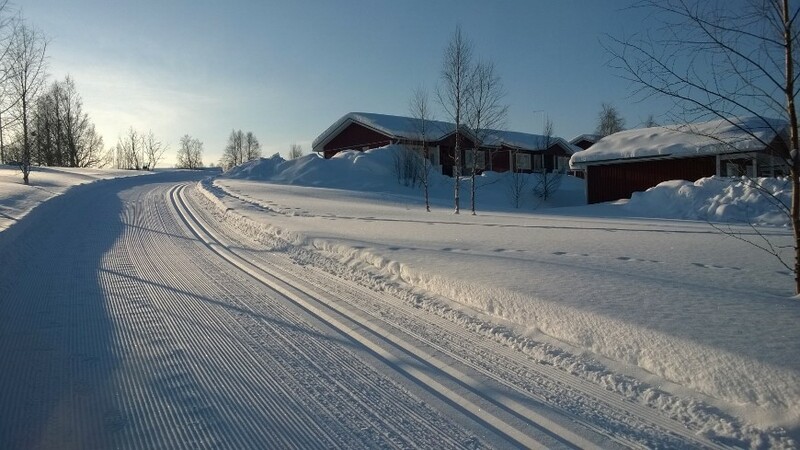 Late winter in March and April, with good cross-country skiing tracks and a sunny weather, is considered by many the best time to travel to Lapland. But the mid-winter in Lapland has its own charm! It may seem strange that the sun does not rise at all. It doesn’t mean that the sky is always black. There is a twilight in the sky and thanks to the white and pure snow and gorgeous colors in the sky, the darkest period of the year does not feel so bleak and dark. "At the end of the polar night in January the colors are spectacular on the northern sky, ultramarine blue and purple-red", Paula says. Also the peace of nature in mid-winter gives a visitor an unforgettable experience - not to forget the northern lights! According to Paula, the majority of the visitors want to experience a variety of activities independently. In the winter it is possible to rent snow shoes or go skiing. Cross-country skiing and snowmobile trails leaves right next to the cabins. Lomamaja Pekonen is happy to organise the equipment and different activities for the visitors in cooperation with the local companies. Muonionjoki river offers perfect setting for canoeing, swimming and fishing. Muonio is also a great place for bird watching. According to Paula, active enthusiasts have spotted ​​there up to 100 different species of birds. Part of the rooms have a good view over the Muonionjoki river. You only need binoculars or a telescope! Lomamaja Pekonen sells also fishing licenses. Paula's kindness and genuine interest to serve the visitors leads many people to return to Lomamaja Pekonen year after year. The guesthouse is also known for its clean rooms. "The rooms have to be clean and in good condition – so good that you would want to live there yourself. Cleaning cannot be left half-way and think that it is clean enough for the tourists. " Paula says.